Discover the Southern Star Groups Technical Centre at www.windowsanddoors.build. 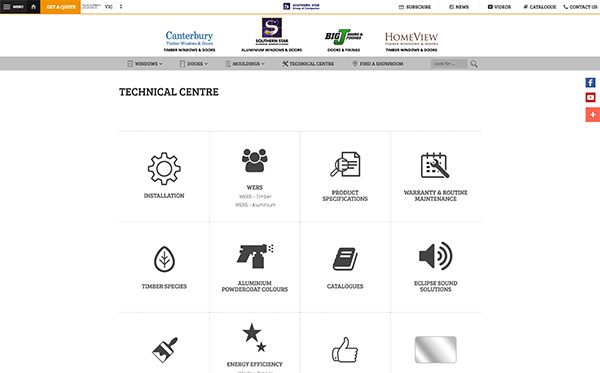 Our website contains a Technical Centre area where you can find useful information on loads of handy topics. The installation section contains downloadable PDF’s that provide you with diagrammatic instructions for installations of various window and door products. The Window Energy Ratings Scheme (WERS) rates the energy impact of windows in housing anywhere in Australia. All window and door products manufactured by the Southern Star Group are WERS rated and our alliance ensures that our products comply with their standards and codes and meet best practice. Discover WERS ratings for various products here. Specifications include dimensions and diagrams of aluminium and timber windows and doors with frame sizes, configurations and product codes. Helpful tips on cleaning and maintaining your Southern Star Group products. We have cleaning techniques for cleaning glass, aluminium, timber and hardware. This section also contains a copy of our standard warranty. Learn about the different timber materials we use for our Canterbury Timber Windows and Doors: Meranti, Western Red Cedar and KD Hardwood. We can even assist in choosing the right timber for you. View our standard offering of powder coat colours for aluminium windows and doors. You can also see some state exclusive colour options. This section houses our combined product catalogue containing all of our windows and doors from Southern Star Aluminium Windows and Doors, Canterbury Timber Windows and Doors and Big J Doors and Fixings. You can view or download a digital copy of the catalogue right here. Eclipse Sound Solutions by the Southern Star Group are high performance acoustic options designed and tested to minimise unwanted noise. Learn about several solutions available to help halt soundwaves traveling through your windows and doors into your home, ranging from glazing options to improved seals. TimGuard is an innovative semi finished two-coat clear timber sealing solution exclusive to the Southern Star Group that provides superior protection to timber products. Learn about what sets it apart from traditional sealing methods and why it’s the clear choice for timber window and door protection. Windows and doors can make a big difference in the energy efficiency of your home. This section is dedicated to explaining energy efficiency and exploring solutions we offer to improve it. We discuss the importance of widow and glazing choice and the options we have to ensure your home is as efficient as possible. The Southern Star Group is committed to meeting and exceeding customer expectations with ongoing quality. This important aspect of our business is explored and we detail how we achieve our dedicated goals. There’s even a video on the opic to check out. Choosing the right glass can make the difference between an underperforming window and one that works to realize the full potential of your home. This section focuses on glazing choices and how to determine the most appropriate for your application and goals. We even have some handy tips to help you decide. Bushfire Attack Level Ratings are a vital element of Australian living. Discover what BAL Ratings are, what each rating level means and the real world effects these have on your home. BAL Ratings are an official rating system recognized by the Building Code of Australia. We love the environment and are proud to do what we can to help protect the earth and make it a better place. We have developed a detailed Environmental protection Policy. You can read about our objectives and some of the great initiatives we implement here. Our website has plenty of videos to check out categorized into several helpful categories. You can learn about our company, products and check out handy installation videos. The Technical Centre is a fantastic resource available to anyone who would like to access the information. Check it out today!